If you've ever found that perfect pair of shoes only to discover that the only pair left is half a size too big, you may already have used insoles. Insoles shouldn't be used as a substitute for properly fitting shoes, but they can be a savior in a fashion emergency, like when you just have to have those shoes which are just a little bit too big.Insoles can also be used to make your shoes more comfortable, or to create a higher level of support for your feet. They're particularly useful for athletes, who put their feet through a lot more strain than the rest of us do, or for people with foot problems such as Achilles pain or tendonitis. 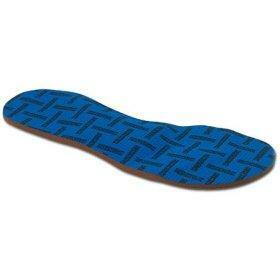 Special scented or super-absorbent insoles help deal with the problem of sweaty feet--not a good look! These come in particularly handy during the summer months, when you're more likely to ditch the socks or hosiery in favor of bare feet in your shoes. Summer Soles makes a range of open shoe insoles which can be worn with even the strappiest of sandals. Just peel them off and replace them when you're done! Although insoles can be very helpful for people with narrow feet, who find it particularly difficult to find shoes that fit, they should never be seen as a substitute for buying the right size. Insoles can allow you to make minor adjustments to your shoe size, and may allow you to buy a shoe up to half a size larger than your usual size. While this is OK for dress shoes, which are generally worn for just a few hours at a time, if you're buying walking or running shoes, it's important to make sure that you get the right fit. If you're having problems finding a shoe that fits, visit your local shoe store to be properly measured, and ask their advice where to find shoes in your size. There are also a large number of narrow and wide width shoes on the market these days, so even the most difficult-to-find sizes can usually be tracked down eventually.